On International Women’s Day we would like to officially introduce the newest member of our HEMS team, Dr Karen Goddard. We are delighted to have Karen, an anaesthetist at Craigavon Hospital, as part of the HEMS team. 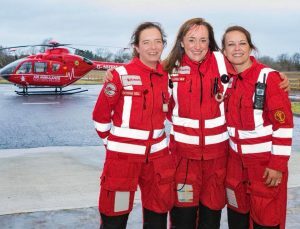 We also would like to take the opportunity to celebrate the other incredible women who are part of the HEMS team Dr Catherine Bell, Dr Sinead Campbell-Grey and Paramedic Emma Boylan. We are grateful for their dedication and determination. Incredible women and role models.